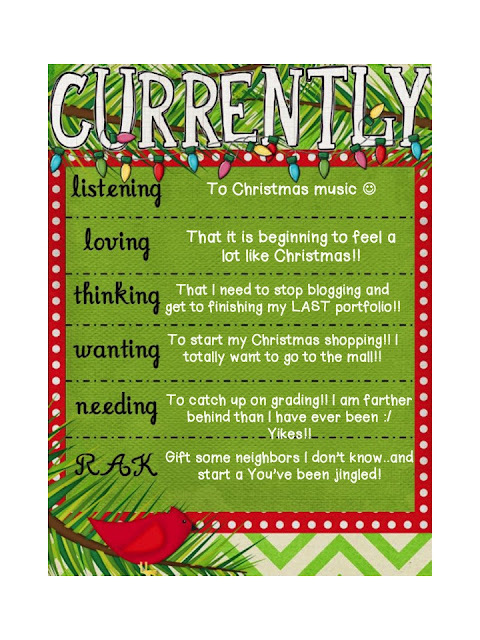 Teaching in Paradise: December Currently and Christmas Cards! Oh my goodness..Time sure does fly by when you're busy! It seems like yesterday we were all going crazy with our Monday Made It's over the summer and posting pictures about getting ready for the start of the school year..now half the year is gone and it's December!! December is my absolute favorite time of year. I love everything about Christmas! I love all of the decorations, the lights, and the holiday spirit!! Seems like people are happier and nicer this time of year...hmm maybe we should leave decorations up all year round?! haha. 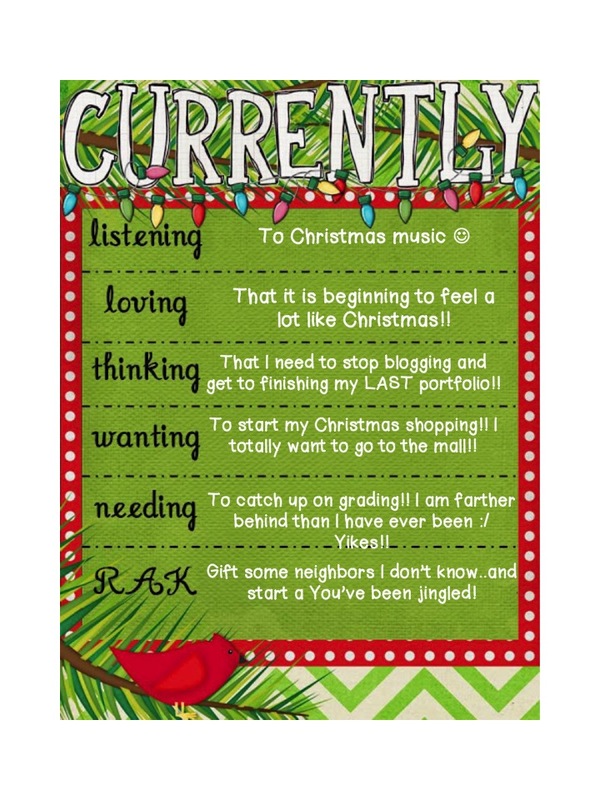 I have been wanting to get started CHristmas shopping so badly...but I needed to get done with my portfolios. I've been talking about it a lot lately for those of you who have been following me. I've finished 2 of 3 and am hoping to crank this last one out today. I'm hoping to finish by 3 when the boy gets off work so we can start some holiday shopping! Last but not least..I would like to share our Christmas Cards. My students have been working on starting their Christmas cards to their families. This was a pinterest inspired card. All you need is various colors and sizes of green paper. I used some scrapbook papers and cut them up. The kids then put them in order from big to small and create a Christmas tree! They love this!! Have a great and busy week! Your Christmas cards are so cute!! I was at the mall today, and it was INSANE!!! Practically done Christmas shopping though, so that's good! I definitely need to start my Christmas shopping too...though I always tend to get sidetracked by that "super cute whatever that I NEED to have" haha. Glad I found your blog through Farley's currently! So cute! I love your cards. I love seeing Christmas decorations everywhere! I haven't decorated yet, lol but I love that other places have. I need to get on it.